It's been a while since we've had multiple big releases on the Wii U and 3DS eShops but this week changes that. Starting with the 3DS we have 3D Streets of Rage 2. The sequel to the original Sega Genesis classic is the latest on the 3DS to receive the 3D remaster treatment for those who utilize the 3D option (while I tend to keep my 3D off, it still looks nice). Over on the Wii U there's DK Jungle Climber. This is an interesting game in which players have to use L and R to jump and swing on pegs to progress through the stage. It may sound strange for a Donkey Kong game...but then again so was Donkey Konga and I enjoyed the heck out of that one. As I've stated before, just because a game in a franchise is different doesn't make it a bad game. Finally is probably the biggest of the releases this week as The Binding of Issac: Rebirth hits the Wii U and New Nintendo 3DS XL eShops. The Binding of Issac: Rebirth is a remake and expansion to the original game and includes new playable characters, enemies, bosses, and items. What gets me though is why it's listed for the New Nintendo 3DS XL as opposed to just the normal 3DS eShop. I'd have thought that you could use the face buttons to fire, but maybe they thought it was best to utilize the C-stick and extra shoulder buttons. Then again I haven't played Rebirth myself and have only seen videos so there might be more to it than that. 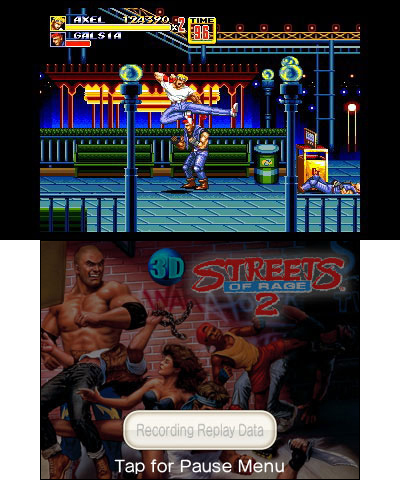 3D Streets of Rage 2 ?? The sequel to the original rumbler is back and re-mastered in 3D. Slam the asphalt with bigger, better and totally devastating attacks. Use secret weapons to bash your way through gangs of bikers to rescue your friend and defeat Mr. X. Click here to view a trailer for the game. The Binding of Isaac: Rebirth ?? Rebirth is a remake and expansion of The Binding of Isaac ?? now with new playable characters, enemies and bosses, and more than 110 new items. Available on both Wii U and New Nintendo 3DS XL, this totally retooled and greatly expanded version of the game also features new graphics rendered in a semi-16-bit style. DK Jungle Climber ?? King K. Rool is up to no good again, and it? ?s up to Donkey Kong to swing into action. This Nintendo DS platformer uses a simple control scheme that makes the game fun and easy to play ?? players of all skill levels can swing and climb to new heights. Shantae and the Pirate? ?s Curse (Wii U and Nintendo 3DS) and Mighty Switch Force! 2 (Wii U and Nintendo 3DS) from Wayforward are on sale beginning at 9 a.m. PT on July 26 until 8:59 a.m. PT on Aug. 2. Midnight is 50 percent off (reduced from $1.99 to $0.99) until 8:59 a.m. PT on Aug. 6. In addition to video games available at retail stores, Nintendo also offers a variety of content that people can download directly to their systems. Nintendo adds new games weekly to the Nintendo eShop on the Wii U console and the Nintendo 3DS family of systems, the Nintendo DSi?? Shop for the Nintendo DSi system and the Wii?? Shop Channel for the Wii console. The Wii Shop Channel offers games and applications and uses Wii Points? ?, which can be purchased via the Wii Shop Channel. The Nintendo DSi Shop offers games and applications and uses Nintendo DSi Points? ?, which can be purchased in the Nintendo DSi Shop. Remember that Wii U, Wii, Nintendo 3DS, Nintendo 3DS XL, Nintendo 2DS and Nintendo DSi feature parental controls that let adults manage some of the content their children can access. For more information about this and other features, visit http://www.nintendo.com/wiiu or http://www.nintendo.com/3ds.